In this school assembly show, "Professor STEM" makes the Scientific Method Easy to Understand for kids of ALL ages. Professor STEM puts science in the hands of several students. This 40 minute school assembly show focuses on science with everyday objects. Great content for all ages! Prof. STEM teaches the Scientific Method in an unusual way. He invites one student on stage to act the part of Daniel Bernoulli - one of the greatest scientists to ever live... and the kids learn how young Daniel learned about our natural world - by looking and experimenting . . . SCIENCE! It's a little bit of history, a lot of hands on science, and a great motivational workshop with the goal of inspiring students to love science! Students love the fun and teachers love the lessons! We talk about the scientific method, chemical reactions, density, air pressure, liquids, solids, gases, Bernoulli's Principal, airplanes, lift, vortexes, energy and technology. Professor STEM's Science Show makes science easy to understand. Students participate on stage in fun, hands-on lessons while discovering that simple household items can be used to perform crazy science experiments. 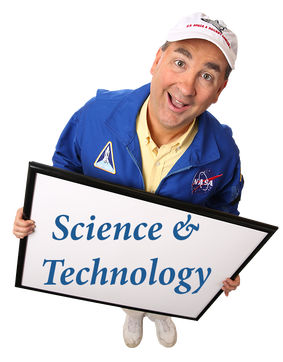 Invite Empower School Shows to bring Professor STEM's Science Show to your school!! You'll be glad you did.